It’s been five long years since the last original God of War game was released (God of War: Ascension in 2013) and eight long years since the last numbered God of War game (God of War III in 2010), but Kratos has finally returned, and he has brought with him drastic changes in both gameplay and personality. Not to mention, he now has a plucky young sidekick: his son Atreus. 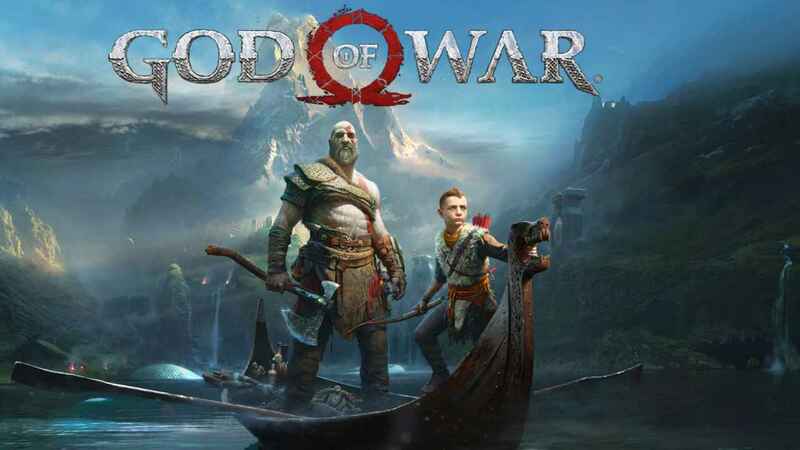 This 2018 release serves as both a spiritual reboot of the franchise and a direct sequel to God of War III. Far removed from his time murdering gods in Ancient Greece, Kratos now spends his days in the world of Norse mythology living in a cabin in the woods of Midgard. The sudden loss of his wife sets the story in motion as Kratos and Atreus must travel to the highest peak in the Nine Realms to spread her ashes, fulfilling her final wish. SIE Santa Monica brought God of War back in 2018, but I feel they could have also easily titled it Yelling at Your Son Simulator . . . of War. Naturally, when you have a track record as long as Kratos does, leaving your old life behind is easier said than done, and try as he might the sins of his past come calling when the inhabitants of the Nine Realms learn of his presence. This makes his already perilous journey up the mountain all the more dangerous. As previously mentioned, this soft reboot/sequel gave SIE Santa Monica a chance to reinvent Kratos for a modern audience. Thankfully, they do a better job of this than Gearbox did with Duke Nukem in the ill-fated 2011 release Duke Nukem Forever. This time around, Kratos has a more subdued and quiet demeanor, which is a far cry from the hyper masculinity and sexually charged escapades of games past. There are still flashes of the old Kratos beneath the surface as evidenced in his ability to still utilize Spartan Rage from previous God of War games. Kratos was also given a new gameplay perspective this time around, opting for a third-person, over-the-shoulder view—much like in Horizon or Uncharted—which replaces the fixed camera angles of the original games. The Blades of Chaos have also been replaced with a new weapon, the Leviathan Axe. This axe is imbued with ice magic as well as the ability to return to Kratos’ hand when thrown (akin to Thor’s hammer Mjolnir), which comes in handy both in combat as well as to help solve various environmental puzzles. One of the biggest and most notable changes for me was the combat. The previous God of War games relied on fast-paced, button-mashing combat mixed with high enemy counts and lengthy combos to give each encounter a very chaotic feel, sometimes to a fault. This time around Kratos is much slower and deliberate in his attacks, taking a more Dark Souls approach to well-timed axe strikes and dodge rolls. This shift makes sense and fits in to the modern style we see in recent action-adventure games, but it seemed that while Kratos was slowed down to deliver a much more deliberate style, the enemies were not. Enemies still swarm Kratos and attack with a wide variety of ranged and close combat styles that seem like they have not made the transition to the new speed of combat. There are many situations, especially early in the game when my abilities have not been properly upgraded, that I wish I could pull out a God of War II–esque fast-paced spinning combo with my Blades of Chaos to better control the battlefield. This may have just been a matter of early game learning curve and under-leveled abilities, but it led to more than a few frustrating deaths ultimately resulting in dropping the difficulty for the better part of my time with Kratos. One of the biggest praises I can heap on God of War is how beautiful and smooth the game looks and operates. The only time you will see a loading screen is when you first turn the game on and load your save. After that, scene transitions—cut scenes included—all happen in-game and in-engine, giving you a seamless flow that never hinders or slows you down at all. Granted this can catch you off guard from time to time as QTE’s and prompts will remind you that you can’t let your guard down when the game briefly takes over. Graphically this game pushed my PS4 to its limits with outstanding results. Everything is beautifully detailed and rendered. Regardless of whether it’s the leather detailing on Kratos’s armor, the faces of you and your son, or the wilderness around you; everything has a loving polish that really makes the game feel important and worthy of the AAA big budget status it carries with it. Even if every now and then it makes my console sound like it’s either about to explode or take off into orbit. One of my gripes, more so than my issues with the combat, has to be with the implementation of Atreus. He joins you on your adventure straight away, and while his character growth and importance to Kratos himself cannot be understated, just about everything else about him seems forced and turned up to 11. Maybe I need to go back and replay The Last of Us or Resident Evil 4 to see how annoying Ellie and Ashley were, but Atreus feels like the most annoying companion that I can remember since Navi. Rarely does a moment have a chance to land, or do you have a minute to admire your surroundings before Atreus opens his mouth and spoils everything by adding some unnecessary comment. Whether it’s about how you are doing a puzzle wrong, asking why you are backtracking, acting as an unnecessary second compass, or admonishing you for standing still a second longer than he would like, he always has something to say. Sometimes this is used for story progression or character growth, but usually it feels like it is used to fill dead air, like God of War is a podcast and nobody knows what else to say. Dotted throughout the realms are various places to purchase and upgrade your equipment which not only add statistical improvements to your characters but cosmetic ones as well, which for me is always a nice touch. It adds to the feel of progression as well as changing up Kratos and Atreus’s looks to make thing feel different and new. One big difference between God of War and other top-shelf action-adventure games is its lack of open world exploration. Games like Horizon and Nier: Automata may be built around the ability to freely explore and quest to your heart’s content, but God of War maintains a quasi-linear progression. There are still side missions and plenty of collectibles to find and discover, and the occasional branching alternate path, but for the most part you will be traveling from point A to point B. At the end of the day, God of War is a grand sweeping adventure that is more than worthy of the praise it has received. By far the best God of War game in the series, it also adds yet another jewel to the crown that sits firmly on the head of the PS4 in the current console war. Kratos is back in a very enjoyable and grown-up way that continues to blur the line between video games and art. God of War is currently available only for the PlayStation 4.